indigo: Documentation generated on February 11, 2018 at 11:45 AM (doc job). kinetic: Documentation generated on January 19, 2019 at 11:35 AM (doc job). lunar: Documentation generated on January 17, 2019 at 11:11 AM (doc job). melodic: Documentation generated on January 19, 2019 at 11:06 AM (doc job). A node for publishing joint angles, either through a gui, or with default values. Please note that not all features are available via debian package in groovy or earlier. But all these are available when cloning the branch groovy-devel or later from the repository. This package publishes sensor_msgs/JointState messages for a robot. The package reads the robot_description parameter, finds all of the non-fixed joints and publishes a JointState message with all those joints defined. Can be used in conjunction with the robot_state_publisher node to also publish transforms for all joint states. 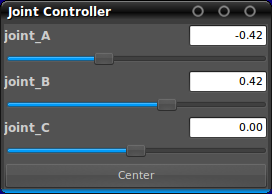 If a GUI is present (set the use_gui parameter or invoke with _use_gui:=true from the command line), the package displays the joint positions in a window as sliders. Each slider is set to the joints' min and max limits, except for continuous joints, which range from -Pi to +Pi. Joint velocity limits are not taken into account when publishing joint state messages. Set the source_list parameter, see below. This node also lets you constrain certain joints to be equal to other joints, or multiples of other joints. For example, if you had two separate joints for two wheels, but wanted them to turn at the same rate, you could constrain the rotation of one to be equal to the other. Or, if you had two unequally sized pulleys, and wanted to have one pulley drive the other, you could constrain the second pulley to turn 3 times as fast as the other. This is can be specified through the dependent_joints parameter or the mimic tag in the URDF. The default value is zero. If zero is not a permissible value (max+min)/2 is used. To override the default value for some joints, use the zeros parameter. An example YAML file is seen below. Publishes JointState message with values read from various sources, including GUI. The keys in the map are the names of the constrained joints. The values are maps which define a parent joint name, and optionally, a factor which to multiply the parent's value by to get the constrained joints value. An example YAML file can be seen below. A list of topics to listen on for sensor_msgs/JointState messages. (?) Somehow narrow the joint limits using URDF-tag safety_controller. Publish the joints' default positions (see Default value above) if no other data input is available. Publish the joints' velocities as 0 if no other data input is available. Publish the joints' efforts as 0 if no other data input is available. The following YAML snippets show examples of how to set the dependent_joints and the zeros parameters using YAML syntax. These can be loaded to the parameter server using the <rosparam> tag in a launch file.